No, the micrometre-screw of Mitutoyo doesn’t change its position. 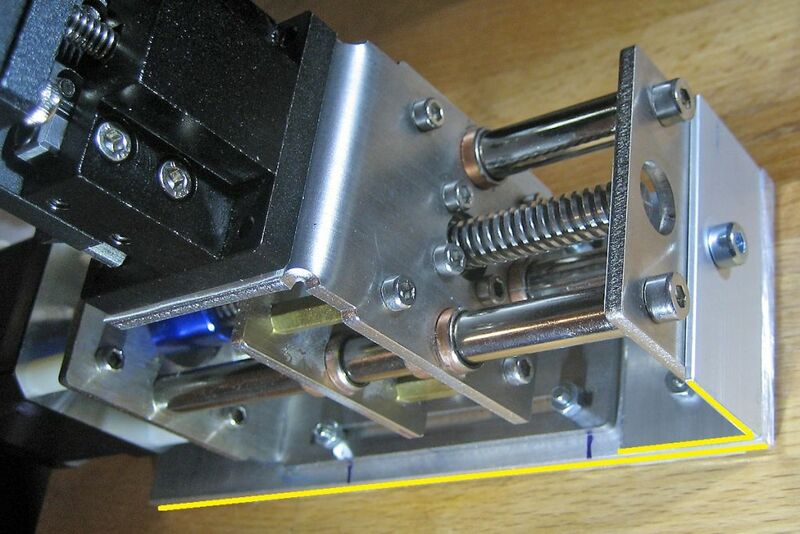 The behaviour of the micrometre-screws of the 3D stage is the same. Only one part of the linear-stage is moved, the screw doesn’t change its place. So, you can use a simple shaft coupling. Does it means any Mitutoyo micrometers do not change position when screwed or only spesific ones? How can I understand this? Because I will order from ebay, I must be sure that I ordered the correct micrometer. 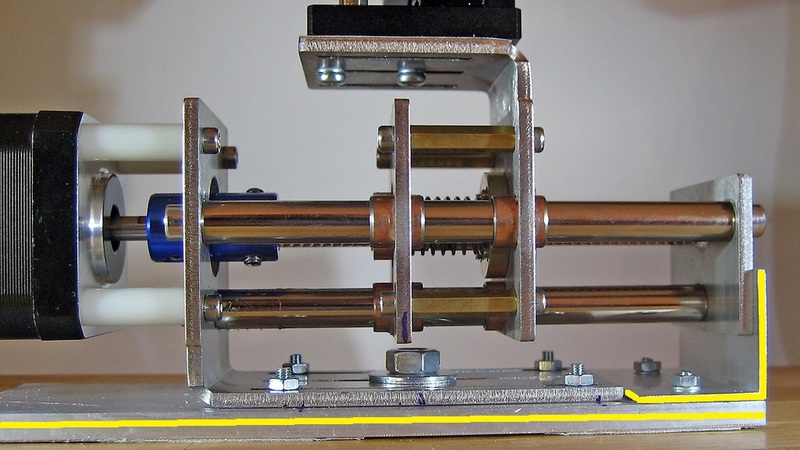 A linear-stage consists of two parts and micrometer-screw too. 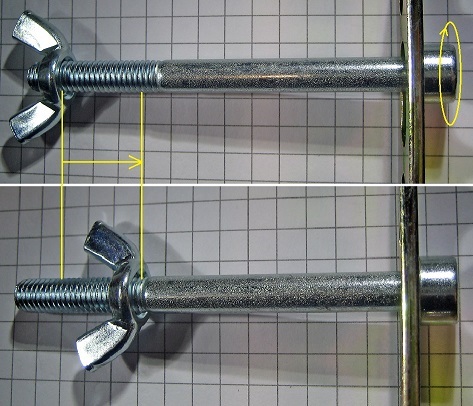 One part of the stage is connected to the micrometer-screw and the second one is moved by the screw. In my case the part of the screw, which can be rotated (with scale) is connected to the shaft. It can be rotated but not moved. The second part of the screw can be moved together with the movable part of the stage. The photo-subject is attached to this part of the stage, which can be moved, if the part of the screw with the scale is mounted immovable. I recently used Newport 423, 433 and 443 linear stages with sm-25 and sm-50 micrometers. But the micrometer was connected to the right or left side for all 3 models. I never used a linear stage like yours so I am curious about how to find a stage like that. I must be sure that the stage I purchase has a not moving micrometer. Do you think China made stages are like yours? Could you send me some ebay links that you are sure about they have not moving micrometers? I would suggest that you take your Newport stage and spin the screw (the part with the scale) and hold it at the same place. Then you will see which part of the stage is moved and which one is only clipped to the other one. So, the clipped one can be fixed and the movable can be attached to the foto-subject. Yes, my 3D-stage ( on the page 4; Posted: Fri Oct 21, 2016 8:42 pm ) has 3 micrometer-screws and no one is moved during the spinning. We are talking about different things. I want to learn about the connection between the micrometer and the gearbox. When you spin the micrometer with the gearbox, the connection must be lenghten or shorten right? I think you use the flexible coupler for this. How much can it lenghten? About 10mms? As I already explained the micrometer-screw (the part with the scale) is not moved during the spinning. So, the micrometer-screw is connected to the gear-box by the simple coupling shaft (hard, strong & stable :-). BTW, have you already tested the behavior of your Newport stage? The SM-50 Micrometer shortens when you screw it. Could you send me a video when your rail is working? I want to see it working to understand fully. This is only an optical illusion. The stage is bigger than the micrometer-screw and you think automatically that the stage should be stable and screw has to move. So, it depends on that which part of the screw is mounted stable and cannot change its positon and which part is moveable. Thanks for your great help about this matter. Bytheway how is your new rail? Any improvement? It is good enough for the small magnification and quicker than the rail with the gear-box. Is there any dislocation during movement? There is an unwanted movement on my Wemacro rail, it happens periodically on every full rotation. The framing moves periodically up and down 1 time for every full rotation. It is highly disturbing especially at high magnifications. I think my T8 screw rod is not straight perfectly may be it has bended. Still thinking about how to correct it. Mitutoyo stage runs perfectly and the cheap CNC without any problem. I had issues with Stackshot and WeMacro rails I attributed to rail "wobble". This simple addition made a big difference. Many others have reported good results and the chip image on WeMacro's site is done with this Off Axis Loading technique. See thread on "Off Axis Loading". Have you already measured the size of the wobbles (before and atfer)? e.g. By the method I tested the backlash (you know with Zerene). But you should take the photographs along the axis of the movement.